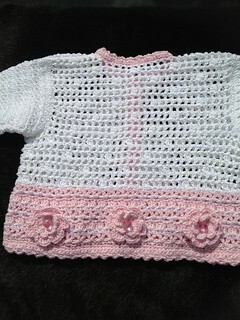 I just finished and gifted this cute 12 month sized dress for a co-worker’s adorable little girl. It is the first time that I have ever incorporated fabric with a crochet or knitting project. I did all of the sewing by hand, because I don’t have a sewing machine, but it was a small project and so it was very manageable. It was another easy project! I asked for a measurement of her chest circumference and made the appropriate amount of granny squares to fit. The fabric was sold bundled as a remnant, and came in a 15×18″ size. I gathered the 15″ side to fit the granny square circumference, and sewed them together. Then simply hemmed the dress to 16″ from the shoulder. 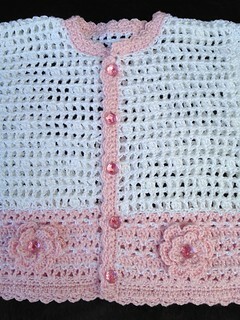 Added two buttons on each shoulder that are closed with using loops that were part of the last crochet round. So cute! I have started making another one using a different fabric. I made the newborn size, and actually used two different patterns: one for the hat and another for the diaper cover. 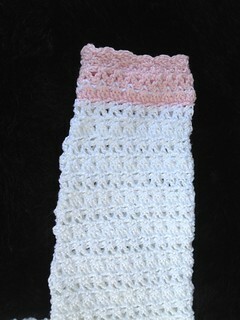 The diaper cover pattern called for doubling the yarn; the hat pattern uses single yarn. It came out so cute! I hope to receive a photo soon from her! I finished the “Radical Top” and before I mail it off to the anxious Birthday Girl, I had to model it… of course! I love it! I have to make myself one!! Wow, has it been that long?! I guess it has! 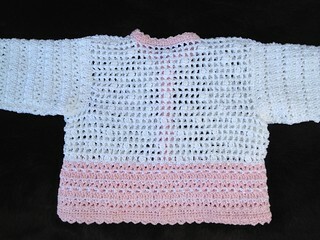 I have been slacking off on crocheting and knitting, but didn’t know it had been this long! Well, I only have one project to show, but a lot of wonderful life memories to cherish since my last post. 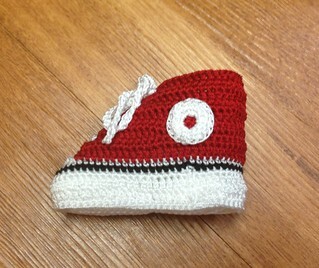 This is a crocheted Giraffe that a co-worker requested for her new grandbaby. She chose the colors that matched the baby’s nursery. I changed the striping pattern from the original pattern to get more of the green to show. This pattern was super easy; a beginner can handle this project with ease. It is 17 inches tall, including the horns. If you stuff the legs and arms as you go, it is so much easier. I love this littly guy! 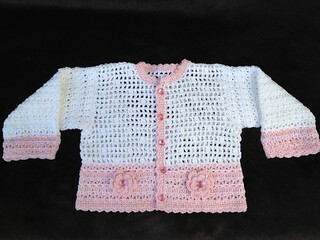 The pattern is from a Japanese Crochet Book that I bought while on vacation in Seattle. The graphs in the book detail the pattern, so there is no problem with trying to translate. The changes I made were adding the flowers along the bottom edge in the front and back and not adding the teddy bear face on the back of the sweater. The pattern stitch using the two colors was intricate and I loved how it came out. 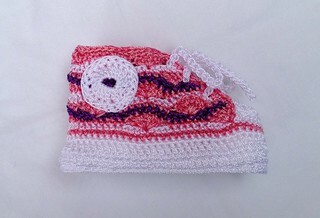 I got a request to make two more pair of crocheted baby sneakers using pink and purple. This is what I came up with, and the recipient loved them! The stitch patterns were taken from a book I found and I just substituted them for the dc rows called for. 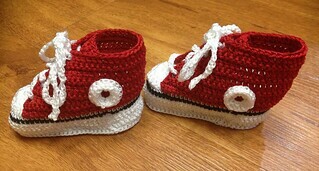 I used the same crochet thread as the red pair in the previous post. 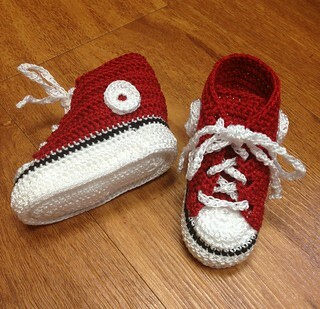 The other change I made is the shoe strings are slip stitches, instead of sc; this makes them less curly. 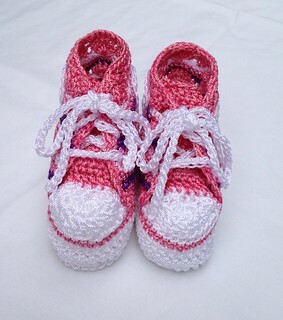 I have been asked to make a pink and white pair next, and will post them when they are completed. I love this pattern! I found this pattern on an Etsy shop called “Childhaps” and just had to make them! 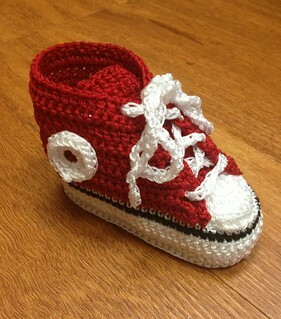 This is the 3 month size, and were made for a friend who is expecting a little boy. 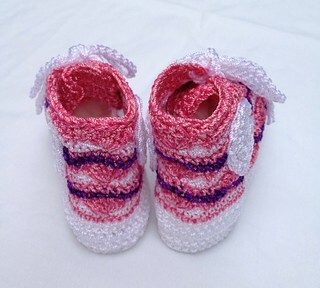 Wouldn’t these look cute in pink for a girl?! 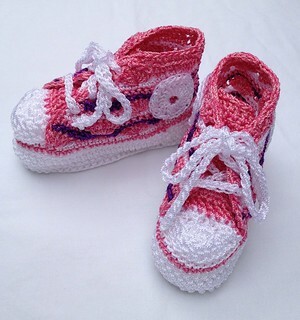 Or with stripes of different colors, or embroidered daisy-stitch flowers! So many cute options. When I shopped for the crochet thread, the store didn’t have red nylon in size 5, so I doubled the red colors of crochet cotton thread size 10, with a nylon thread size 2. Next time I will carry two strands (size 2) of white to make the sole more sturdy.